Complete your living space with this contemporary rectangular shape sofa console table. Fabricated in an alluring dark taupe reclaimed, wood-look finish and featuring a lower shelve that offers additional space for storage or display. This sofa table is a perfect addition to any dicor. A beautiful combination with the 3 piece matching occasional table set. Designed with stylish simplicity, this traditional console table will be an effortless addition to your home decor._x000D_ A dark cherry finish paired with a brushed silver drawer pull gives this classic Demilune shape a fresh update. The storage drawer will help to keep you organized while the open bottom shelf provides additional storage space or surface space to display your favorite accents. Try adding a decorative basket to the lower shelf creating the ideal place to stow scarves, gloves or hats. With a classic contemporary design, this stylish console accent table in a warm dark taupe wood-look finish adds flare to an entryway, hallway, or living room. Using quality MDF material, the thick and spacious rectangular tabletop is useful to showcase an artful display or simply as an elegant place to put down your keys and mail. The graceful and sturdy curved cross legs reach down to the handy bottom shelf for an additional storage or display option. The compact size also makes this console table ideal for space challenged homes while still making an eye-catching statement. Assembly is required. If maximum functionality with style is key, then this contemporary hall console table will hit all the right notes in your home. It starts with the simple but elegant rectangular table top made from durable MDF material, finished in a warm dark taupe wood-grain look that includes two spacious drawers with easy built-in grooved handles at the top to store magazines, papers, keys. This is boldly framed over an angular black metal base with a unique design. An accent table this versatile can easily move from an entryway, to a living room, bedroom, or office space to meet your needs. Assembly is required. 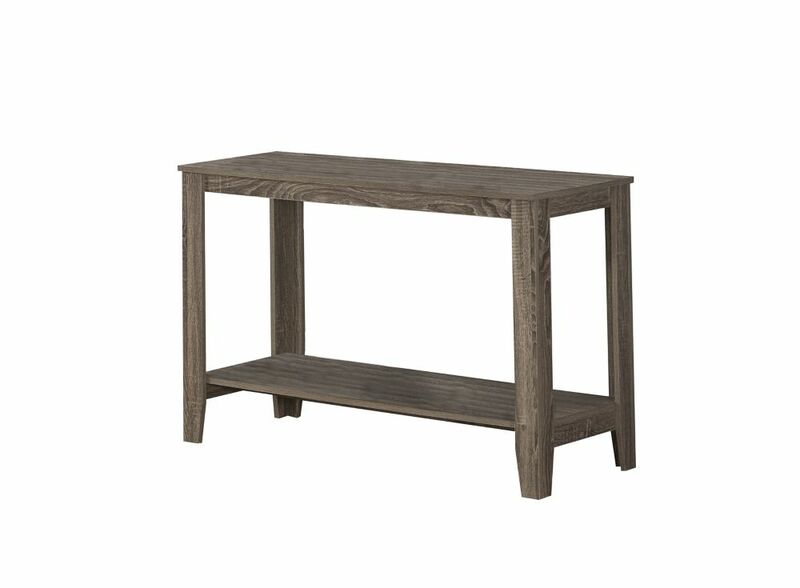 Grab your guests attention with this stylish dark taupe reclaimed wood-look, accent table. Featuring a unique curved base and a three tiered, open concept design, this modern unit is perfect for dressing up any wall in your home or displaying your favorite decorative items. Dark Taupe Reclaimed-Look Sofa Console Table Complete your living space with this contemporary rectangular shape sofa console table. Fabricated in an alluring dark taupe reclaimed, wood-look finish and featuring a lower shelve that offers additional space for storage or display. This sofa table is a perfect addition to any dicor. A beautiful combination with the 3 piece matching occasional table set. Dark Taupe Reclaimed-Look Sofa Console Table is rated 1.0 out of 5 by 1. Rated 1 out of 5 by sandyp101 from Poor quality Over priced and the "look" of the recalimed wood is spotty at best. Hello Irene, the top is made from MDF (Hollowcore) with a laminated wood-grain look. We hope that clarifies. Thank you. Hello Pamela, the dimensions of this console table are: 44 in. Lx18 in. Dx28 in. H. You may also view the full dimensions here: http://monarchspec.com/PRODUCT_PHOTOS/LINEART_DRAWING/I 7915S.jpg. We hope that helps. THank you.